YEAR ONE supplies you with muscle car parts for your classic Buicks, Chevrolets, Chrysler, Ford, Oldsmobile and Pontiac muscle car models. Enter the promo code - CATALOGS - in the "Apply Promo Code" box at checkout on the YearOne website. Replacement Parts - Whether you're performing a minor repair or a complete restoration, you deserve to have the best parts under your hood. Outfit your classic muscle car with premium parts that will cover your body and brakes, a/c, engine, suspension, transmission, wheels, and every inch of your car's interior. 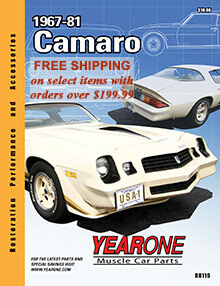 Shop the Year One catalog or online for parts for 1964 to present day Ford Mustangs, the classic Oldsmobile Cutlass, Pontiac Firebirds, GTO and Grand Prix models, the Buick Skylark and Regal, and a wide selection of Chevrolets, from vintage Corvettes to Camaros, Chevelles, El Caminos, Impalas, Chevy Novas, and more. Simply type in the year of the car you're working on, the make, model (or both), and start shopping. Performance - Enhance your favorite muscle car machine with the ultimate performance parts that will intensify your vehicle's overall efficiency. YEAR ONE Auto Parts features top of the line performance parts from the most respected brands in the automotive industry including filters and fuel lines, intakes, ignition parts, gaskets, and more muscle car parts that will help control how your vehicle performs and turns at every corner. Tools & Supplies - Equip your garage with the right tools for any task, with durable tools and supplies that will make routine car maintenance an easy and effortless chore. You'll find basic garage tools and supplies as well as specialty body, brakes, electrical, engine and exhaust tools, plus tools that will help you change a tire, your oil, or a wiper blade in a snap. Accessories & Apparel - YEAR ONE Auto Parts brings you a wide range of automotive extras ranging from racing equipment and car covers to floor mats, inflatable storage systems, audio speakers, and more supplements guaranteed to protect, improve and maximize your enjoyment during every ride. Show your love for your muscle car model with t-shirts, hoodies, caps and gear that you'll wear with pride. From classic Camaros to vintage and present Mustang models, the YEAR ONE catalog brings you high quality muscle car parts to fit all of your automotive needs, with thousands of affordable parts, tools, and accessories to choose from.